Catalonia - Balsareny Castle - kcc-erasmuss Webseite! There are also many beautiful castles in Catalonia. Although we do not have any castles in Navàs, there is a little one at the top of a hill in Balsareny, our neighbour village. W ego to visit the castle from time to time walking because it is only 5 km far from our school. Balsareny castle is located on a 420 m high hill in the town of Balsareny. This fortification dated back to 951 is a good exemple of civil Catalan style. Te corrent Building is in a good of gonservation. It has been restored at the end of the 19th century. Te panoràmic views onot Llobregat river , Balsareny town and Montserrat mountain and the Pyrenees ara excellent. 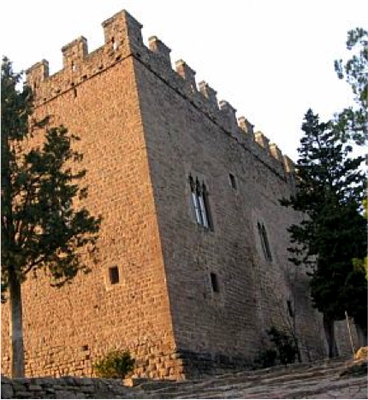 Balsareny castle is one of the few regular and homogeneous castles in central Catalonia. It has a pentagonal shape almost regular. 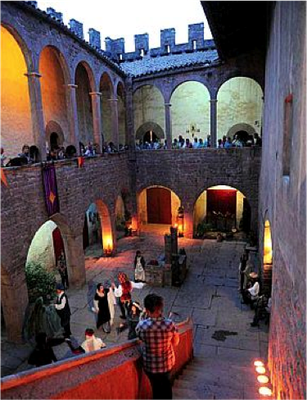 On the ground level there is a spacious room which preserves the whole amblance of gothic times. A Stone staircase brings you to the first floor where there is a horsehoe gallery and rooms. On top of the Building there ara battlements with loopholes typical of the last medieval centúries. Te Building was declared a “ Bé cultural d’interès nacional” ( heritage of national Interest) in 1949. This long history castle has been owned by several famílies until nowadays. Initially the castle was a property of the vicarial and noble family called Balsareny. Nowadays it belongs to Alós family.